Sorry, no FAQ questions available for this section. 1. How do I place an online order? To begin the checkout process, click “ORDER” under the Shopping Bag tab. Login to your account, create a new account, or checkout as a Guest. Follow the instructions as prompted through the checkout. Complete the Billing information including the correct name, address and phone number of the cardholder. Complete the payment information using a Credit Card. If the 3D Secure is activated on your card, you will be redirected on your bank’s webpage to authenticate the transaction. IMPORTANT: You will receive 2 emails. The first one acknowledging the receipt of your order and the second one once the order is validated by Christian Louboutin, confirming the shipment of the products. 2. How do I know if my order has been placed? As soon as your payment is validated and accepted by your bank, we will send you an email confirming your order. This email confirms that you have correctly placed your order. If you didn't receive the email, this generally means that there is an error with your order: either your bank hasn't authorized the payment, or there is an error in the information that you have entered for the order. If this is the case we invite you to contact your bank or to contact us directly at 0800 048 2455 - OPTION 2 from Monday to Saturday, 9AM to 6PM (GMT +1) to verify the status of your order. 3. How can I modify/cancel my order? The billing and shipping addresses on any given order can only be modified before our team has processed the order. It is still possible for us to cancel or to change the billing and shipping addresses of an order before the order is prepared and shipped. Moreover, it is impossible to change the size, regroup several orders, or modify the order contents in anyway. If you wish to cancel or modify your order before it is shipped, you must contact us as soon as possible at 0800 048 2455 - OPTION 2 from Monday to Saturday, 9AM to 6PM (GMT +1). We will do our best to handle your request. 4. How much time does it take before my order is processed? Each and every order is verified, the following information above all: the billing address, shipping address and the type of payment used. These additional verifications can increase the shipping delay by two days. Shipping generally takes one to two days, after you have received the email confirming the shipment of the order. 5. How can I see the status of my order? 6. Is it possible to have a gift message and wrapping for my order? All orders placed on the Christian Louboutin online boutique are sent in their original boxes, along with several carefully packaged accessories (dust bag, heal tips (if applicable), replacement spikes (if applicable)). You can select our free gift wrapping option just before the payment of your order. You can also add a personalized message that will be printed on a gift card. This option is available at the end of the order process. 7. Why wasn't my order accepted? We would like to inform you that we only accept personal credit cards, registered in a country that we deliver to. If your payment isn't accepted, we invite you to contact your bank as to verify that the transaction hasn’t been blocked. If an error message appears after finalizing your payment, you should follow the indications. If the message contains a phone number, we insist you call that number. You can also call us at 0800 048 2455 - OPTION 2 from Monday to Saturday, 9AM to 6PM (GMT +1) so we may help you with your purchase. 8. I can't seem to place an order, what should I do? When filling in the form, you must specify the type of payment that will be used for the transaction. Christian Louboutin reserves the right to accept or refuse any order. Each and every order is verified, most importantly the billing address, shipping address and the type of payment used. To ensure the best customer experience, we advise you to place all orders on a computer and with our preferred browser Google Chrome. For a credit card payment, with a Visa or a MasterCard, you will be transferred to your bank's website to validate the transaction. If you aren't transferred, we invite you to contact your bank to be sure that your 3D Secure™ system for your card has been activated. 9. I can't access my account, what should I do? To access MY ACCOUNT, we invite you to click on the link in the upper right hand corner of your screen and enter your email address and password. If you have forgot your password, we invite you to click on the link FORGOT YOUR PASSWORD on the login page. You will receive an email inviting you to create a new password. You can also call us at 0800 048 2455 - OPTION 2 from Monday to Saturday, 9AM to 6PM (GMT +1), or by email at eboutique.europe@christianlouboutin.fr. 10. Is it possible to buy a gift voucher? You can purchase a gift voucher in any of our Christian Louboutin boutiques. However, please note that this service is not available on the Christian Louboutin online boutique. Gift vouchers are only valid within Christian Louboutin boutiques in the country of purchase and are not accepted on the Christian Louboutin online boutique. For further information regarding this service, we invite you to contact our UK & Ireland Customer Service team by telephone: 0044 843 227 4322 or by email : customerservice@uk.christianlouboutin.com , Monday to Saturday, 10AM – 6:30PM (GMT). 11. Does the online boutique offer a tax free service? Christian Louboutin online boutique does not offer a tax free service. The products purchased from Christian Louboutin online boutique include VAT. We do offer a tax free service within our Christian Louboutin boutiques, under certain conditions. For further information we invite you to visit our boutiques or to contact our UK & Ireland Customer Service team by telephone : 0044 843 227 4322 or by email : customerservice@uk.christianlouboutin.com Monday to Saturday, 10AM – 6:30PM (GMT). Please note that products that have undergone a tax refund can neither be returned nor exchanged nor refunded. 12. How long does an item stay in my Shopping Bag? An item placed in your Shopping Bag is not reserved. To secure the item, you must complete the checkout process. 1. What is the shipping time for an order? Deliveries are made by our only transport service, DHL. All deliveries are express and require a signature upon delivery. The shipping delay is generally 1 to 2 days for major cities, not including weekends and holidays. Certain regions can be subject to delays (for instance: Corsica). The delivery can also depend on the verification of the order (up to 2 additional days). You will receive an email confirming the shipment with a link to the courier’s website allowing you to track your parcel. Shipping is a fixed cost of: €30, £28 or CHF60 for shoes/bags and accessories and €12, £9 or CHF30 for cosmetic products. In case of a return, shipping fees are not refunded. To be sure that these costs are correct, please click on the flag located in the bottom left hand corner of your screen and select your country in the list of shipping destinations. 3. In which countries can I have my order delivered? 4. What information do you need for the delivery? All information useful for the courier to deliver your parcel is appreciated. For example your floor, apartment number, entry code, and a telephone number that you can be reached at. 5. Where can I have my Christian Louboutin order delivered? To ensure a safe delivery, the Christian Louboutin online boutique will not deliver to po-boxes, security boxes, freight forwarders or hotels. It is also unfortunately not possible to ship to a Christian Louboutin boutique. 6. Can I change my delivery address? If the order has yet to be verified by our team, you can contact us by phone at 0800 048 2455 - OPTION 2 from Monday to Saturday 9AM to 6PM (GMT+1). If the order has already been processed, we will do our best to change the address; this however, may imply a potential one to two day delay for the delivery. 7. How can I track my parcel? Once your order has been shipped, you will receive an email confirming the shipment. You will also be provided with a link to our transporter's website, where you can track the whereabouts of your parcel. Feel free to contact us at 0800 048 2455 - OPTION 2 from Monday to Saturday, 9AM to 6PM (GMT +1) for all questions concerning your delivery. 8. I haven't received my order, what can I do? The first thing to do is to verify the status the order. The provided link to our courier's website will allow you to check this. You are also welcome to contact us by phone at 0800 048 2455 - OPTION 2 from Monday to Saturday 9AM to 6PM (GMT+1) or by email eboutique.europe@christianlouboutin.fr. 1. What types of payment are accepted on the Christian Louboutin online boutique? We don't accept payment plans, bank transfers, international credit cards or debit cards. The only means of payment that are accepted on the online boutique are personal credit cards (other than business cards) of which the cardholder must physically reside at the billing address. The billing information declared during the order must correspond to the cardholder. Moreover, only credit cards registered in the European countries serviced by the online boutique are accepted. Lastly, the credit card used must be registered in the same country as the delivery country. 2. When exactly do I get charged? Your Card will only be charged when the order is shipped. Please know that your bank may freeze the funds once the bank authorization has been accorded; however, No funds will be captured until the shipment. 3. Is my payment safe? The Christian Louboutin online boutique is a secure website offering the sale of its own Christian Louboutin products. The Christian Louboutin online boutique acknowledges the 3D Secure™ payment system. This system protects your card against unauthorized use by sending you a private password each time that you purchase products on the Christian Louboutin online boutique. To use this service, it must be activated by your bank that issued the card. To be able to make easy and safe purchases, a lock will appear in the upper left hand corner of your browser while your make your payment on the Christian Louboutin online boutique. You will also notice the site address (URL) in the upper left hand corner of your browser with start with 'https:' at the place of ‘http:’ this confirms that the page is secure. 4. Does the Christian Louboutin online boutique offer payment plans? The Christian Louboutin online Boutique does not accept the following means of payment: payment plans, bank transfers, international credit cards and debit cards. You can place your order as long as the billing and shipping addresses are both situated in the same European country serviced by the online boutique. 1. What is the return policy for the Christian Louboutin online boutique? If you wish to return a product, you must inform Christian Louboutin within 14 days of the receipt of your order. To organize the return of your order, we invite you to contact us at 0800 048 2455 - OPTION 2 from Monday to Saturday 9AM to 6PM (GMT+1) (See "What is the return procedure?"). Please note that Christian Louboutin will not accept any return of fragrances, due to transport restrictions. Online Orders cannot be returned to any of Christian Louboutin’s boutiques. Detailed return instructions are included in the parcel. Products must be returned new, unused and undamaged. Christian Louboutin will only accept returns of products in their original state with all related accessories (dust bags, laces etc, depending on the type of product). In particular, the red outsole of the shoes is fragile and shall remain unmarked and in its original condition. You shall try the shoes only on a clean and carpeted surface and with the warning sticker in place on the red outsole until You are certain to keep them. We will proceed with the refund as long as the original invoice and return authorization number are sent with the product. 2. What is the return procedure? If you wish to return a product, you must inform Christian Louboutin within 14 days of the receipt of your order, either by following the below instructions or by contacting us at 0800 048 2455 - OPTION 2. Log into your " Account". On the Orders page, find the order you would like to return and click Create Return. If you checked out as a guest, go to the tab "Return" (at the bottom right of the screen) and create your return by entering the email address on the original purchase and the order number. Select the item you wish to return and identify a return reason. If prompted, provide additional details regarding the return in the comment field. You will then be able to choose the place and date for the collection of your parcel. The pick-up of your parcel will be done by DHL at your preferred address and chosen day (except for week-ends and holidays). Please note that the pick-up will be done between 10am and 5pm and no shorter time slot will be possible. Once submitted, a RMA will be created and a confirmation email will be sent to the email address on the original purchase. You can also download or send this email to another email address. Add the printed return authorization email as well as the original purchase receipt. Affix the label to your Shipping Box; if using the original packaging be sure that the original label is fully removed or covered. Give your return parcel where the DHL shipping label is affixed to the driver on the scheduled date of pick-up. We invite you to ensure that the DHL driver scans your parcel to confirm the collection. You can track your return on the DHL website www.dhl.com with the tracking number indicated on the label, below the first barcode (“WAYBILL”). Should you wish to return a beauty product (except for perfumes), please contact the Customer Service at 0800 048 2455 - OPTION 2 to organize the collection of your parcel. 3. Can I return an online purchase in a store? Products purchased online can only be returned to the online boutique. No exchanges can be made with our physical boutiques. 4. The red soles are delicate, how should they be tried on? We won't accept the return of products appearing to be used or damaged. In particular, the red soles on our shoes are fragile, and must be returned in perfect condition. Which is why all shoes must be tried on a clean carpeted surface. The plastic stickers on the soles must not be removed, until you are certain that you will be keeping the product. If a pair is returned with a damaged red sole, Christian Louboutin reserves the right to refuse the return or to accept and subtract the cost of repair from the final refund total. 5. Can I exchange the style or the size? The Christian Louboutin online boutique does not offer exchanges. Consequently, all returns are refunded, refunds are made onto the same card that was used for the original purchase. If you wish to change the size or the model, we invite you place a new order. Our customer advisors are available to help you with your choice by phone at 0800 048 2455 - OPTION 2 from Monday to Saturday 9AM to 6PM (GMT+1) or email. 6. How long does it take to process my return? After receiving the returned products, and provided that the return policy is respected, you will receive an email confirming the refund. The refund is transferred onto the same card used for the original purchase. Refunds take 2 weeks following the reception of the parcel. Depending on your bank institution, the transfer can take up to 10 days before available in your account, following Christian Louboutin's confirmation email. 7. Will my order be fully refunded? Christian Louboutin covers all return fees so long as the return policy is respected. So long as the returned products are returned in their original condition without any wear or damage, we will refund the price of the returned product(s), minus the shipping fees. 1. The style I'm looking for is unavailable on the Christian Louboutin site. How can I find it? The stock availability on Christian Louboutin online boutique does not reflect the availability in Christian Louboutin freestanding boutiques. If the style you are looking for is unavailable or sold out on the Christian Louboutin online boutique, it might be available in one of our Christian Louboutin boutiques. To check availability in Christian Louboutin European boutiques (except UK and Ireland), we invite you to contact our European Customer Service team by telephone : 0800 048 2455 - OPTION 1 or by email: customerservice-europe@christianlouboutin.fr Monday to Saturday, 10AM – 7PM (GMT +1). To check availability in Christian Louboutin UK & Ireland boutiques, we invite you to contact our UK Customer Service team by telephone: +44 (0)843 227 43 22 or by email: customerservice@uk.christianlouboutin.com Monday to Saturday, 10AM – 6:30PM (GMT). 2. How to see if the style I'm looking for is available in a specific Christian Louboutin store? To check availability in our Christian Louboutin UK and Ireland boutiques, we invite you to contact our UK Customer Service team by telephone: +44 (0)843 227 43 22 or by email: customerservice@uk.christianlouboutin.com Monday to Saturday, 10AM – 6:30PM (GMT). 3. How do I know my size? Generally our shoes run true to size but as everyone’s feet are different, sizing preference depends solely on the wearer. The most common misconception when purchasing Christian Louboutin shoes is that a larger size will increase the width of the toe box and decrease the tightness of the material; when in actuality, going up in size only affects the length. None of our shoes are pre-stretched, but the majority of our materials will loosen up over time. After multiple wears, most materials will stretch and form to the shape of the wearer's foot, forming a better fit. To assist with sizing differences, our online specialists try on each style and provide general sizing advice on our website. Once you click on a product, you can find “Fit Suggestions” to the right side, above the size chart. To the left, the “Size Guide” shows direct conversions from french sizes to UK and US sizes. We provide these references to help you find the best fit, but should you have additional questions, please contact our Customer Service team for assistance at 0800 048 2455 - OPTION 1 or by email customerservice-europe@christianlouboutin.fr Monday to Saturday, 10AM – 7PM (GMT +1). 4. Can I be contacted when a pair is available? For certain products, we have a « Back in stock » option. When the option is available for a sold out product, you will see a red button "CLICK HERE TO BE NOTIFIED WHEN THIS ITEM IS BACK IN STOCK", this is found by clicking on one of the unavailable sizes. Once the button has appeared you just have to click on it and fill in your contact details, in doing so you will be notified as soon as the pair is back on the Christian Louboutin online boutique. 5. Are the products in my Wishlist reserved? A product added to your Wish List allows for an easier future purchase, or to share it with a friend: In no way does this reserve the product. Also, please notice that items placed in your shopping cart are not reserved. Only a confirmed payment for a product will reserve it. For this reason, if the product you desire is available, we advise you to finalize the purchase as quickly as possible. 6. Can I obtain a Christian Louboutin shoe box or dust bag? Generally, our factory includes one Christian Louboutin dust bag per style. Two dust bags are included for styles in delicate materials, such as strass. Only one shoe box is made per pair during production and unfortunately, we are unable to provide additional shoe boxes upon request. 1. How do I know my size? 1. How can I find the nearest Christian Louboutin boutique? The section STORE LOCATOR will allow you to locate the nearest boutique to you. You will also find their contact details and opening hours. 2. What are the boutiques' opening hours? You can find the opening hours, as well as the extraordinary closing or opening dates of our Christian Louboutin stores, by checking the Store Locator section on our website. You can find these details by clicking on the button « More information » for each boutique. 3. Is it possible to buy a gift voucher? Gift vouchers are only valid within Christian Louboutin boutiques in the country of purchase and are not accepted on our online boutique. For further information regarding this service, we invite you to contact our UK & Ireland Customer Service team by telephone: 0044 843 227 4322 or by email: customerservice@uk.christianlouboutin.com Monday to Saturday, 10AM – 6:30PM (GMT). 4. Do Christian Louboutin stores offer a tax free service? We do offer a tax free service within our Christian Louboutin boutiques, under certain conditions. For further information we invite you to visit our boutiques or to contact our European Customer Service team by telephone: 0800 048 2455 - OPTION 1 or by email: customerservice-europe@christianlouboutin.fr Monday to Saturday, 10AM – 7PM (GMT +1). Please note that products that have undergone a tax refund can neither be returned nor exchanged, nor refunded. Our online boutique does not offer a tax free service. The products purchased from Christian Louboutin online boutique include VAT . 5. Does Christian Louboutin have sales? Christian Louboutin boutiques hold sales on a selection of seasonal styles during the official local sales dates. Our sales are only available in store. Please note that discounted products cannot be returned, exchanged or refunded. Christian Louboutin online boutique never holds sales nor offers discounts. 1. How can I stay informed about Christian Louboutin updates? To stay up-to-date about Christian Louboutin, subscribe to our “Newsletter”. Use the hashtag #louboutinworld or #louboutinhomme when wearing Monsieur Louboutin’s creations for a chance to be featured on our page! 2. I would like to work for Christian Louboutin: where can I send my application? 3. How can I contact the Press Office? 4. How do I open a wholesale account? We are not looking for new partners. However you are welcome to send an email about your business to our Customer Service team customerservice-europe@christianlouboutin.fr, who will forward it to the wholesale department for future consideration. 5. What is Christian Louboutin doing to combat counterfeit products? Our Company is persistently combating the manufacturing and distribution of counterfeit Christian Louboutin products. Our Legal Team has implemented a “zero tolerance” policy and has notably removed countless websites selling counterfeit and infringing Christian Louboutin merchandise. Despite our constant efforts, websites appear and disappear every day. Therefore, we suggest you protect yourself by purchasing only via authorized retailers, or directly with us. To find out more about our anti-counterfeiting initiatives, please visit our Stopfake dedicated page. 6. How can I have an item authenticated? 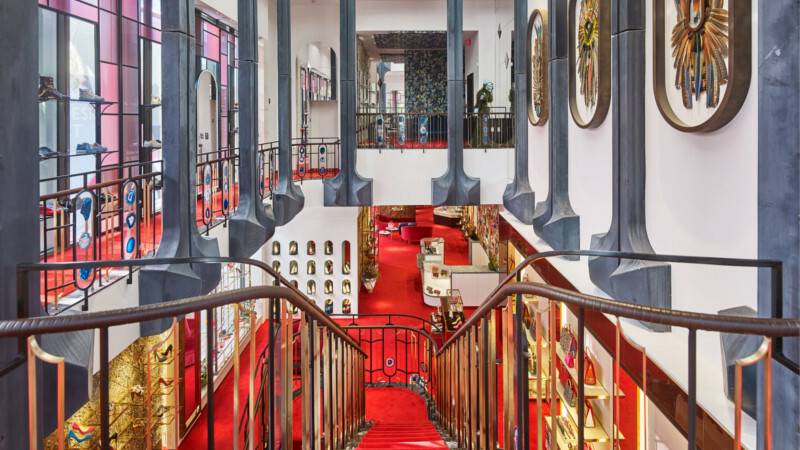 Authenticity of Christian Louboutin goods relies on numerous factors, therefore company policy requires us to view merchandise in person to determine authenticity. The party shipping the package is liable for all shipping charges. If the merchandise is deemed counterfeit, it will be confiscated and you will be provided with an official letter confirming receipt of fake Christian Louboutin goods. Such statements are only dispatched upon receipt of fake goods. On the contrary, if goods turn out to be authentic, they will be returned to you. Please visit our Stopfake dedicated page and contact our Stopfake Team to see if you are eligible for the authentication process. Our boutiques do not deliver authenticity or non-authenticity certificates. Unfortunately, we are unable to provide authenticity services when purchases are made through private vendors such as consignment shops or online auction websites. 7. How can I report a fake Christian Louboutin website? To report a website selling fake Christian Louboutin products, please visit our Stopfake dedicated page and contact our Stopfake Team through the contact form or through the built-in proprietary online store checker. 8. How to get in contact with the Customer Service of Christian Louboutin boutiques ? For all information regarding our Christian Louboutin boutiques (outside UK and Ireland), please contact our European Customer Service team by telephone: 0800 048 2455 - OPTION 1 or by email: customerservice-europe@christianlouboutin.fr Monday to Saturday, 10AM – 7PM (GMT +1). For all information regarding our Christian Louboutin boutiques in the UK and Ireland, please contact our UK Customer Service team by telephone: +44 (0)843 227 43 22 or by email: customerservice@uk.christianlouboutin.com Monday to Saturday, 10AM – 6:30PM (GMT)." Christian Louboutin’s renowned red sole consists of painting the leather sole with our special red lacquer. The red lacquer of the sole wears out with use. This is not a manufacturing defect but normal wear and tear. For all specific care advice concerning our red soles, we recommend you contact the cobbler Minuit Moins 7 or you can get more information within our Christian Louboutin boutiques . 2. How to take care of Christian Louboutin products? Store your products individually in the Christian Louboutin dust bag provided or wrapped in white tissue paper. Christian Louboutin strongly recommends that our customers consult a professional in leather care or a shoemaker for specific care advice. 3. Where can I repair my Christian Louboutin products? Customers who make use of these locations have the sole responsibility for evaluating the suitability of the locations, their services and the results of any repairs conducted thereby. Christian Louboutin assumes no responsibility or liability related thereto. 1. How do I contact the Customer Service for Christian Louboutin boutiques?